Class: Type 4 "Human Torpedo"
The design for the Japanese Kaiten was originally based on the highly successful Type 93 "Long Lance" torpedo. Nearly 400 Type 1's were built and were the only type used operationally. The Type 4 oxygen-kerosene engine produced 1,500 horsepower, and had one shaft. Top speed was 40 knots. Range for Type 4 is listed as 38.5 miles at 20 knots, 23.6 miles at 30 knots, or 16.8 miles at 40 knots. Top speed could be maintained for about one hour. 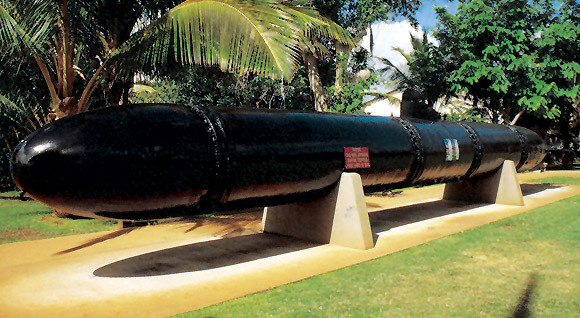 The warhead contained 3,960 pounds of TNT. Approximately 45-50 Type 4's were built in 1945, but were never used operationally. (Carpenter Polmar, Submarines of the Imperial Japanese Navy, p. 49). Many Type 4s were found at Kure Naval Base after the war. 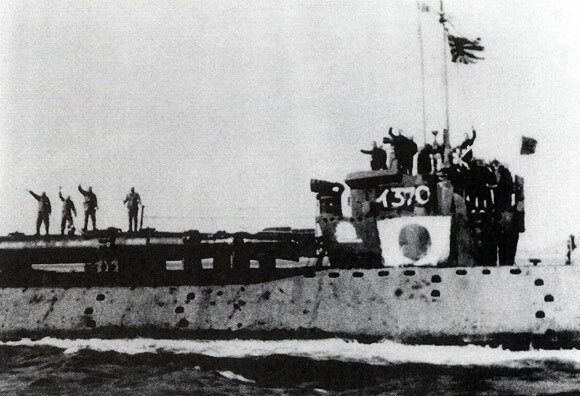 Type 1 Kaitens aboard Japanese submarineI-370 leaving for patrol.